The octopus is a crafty creature. Search it out on the internets, and you will see octopi (or octopuses or octopodes - pick your favorite) changing color and shape (sometimes mimicking other animals) and even walking on land. But why, oh why, would you ever expect to find one hiding in your coffee? 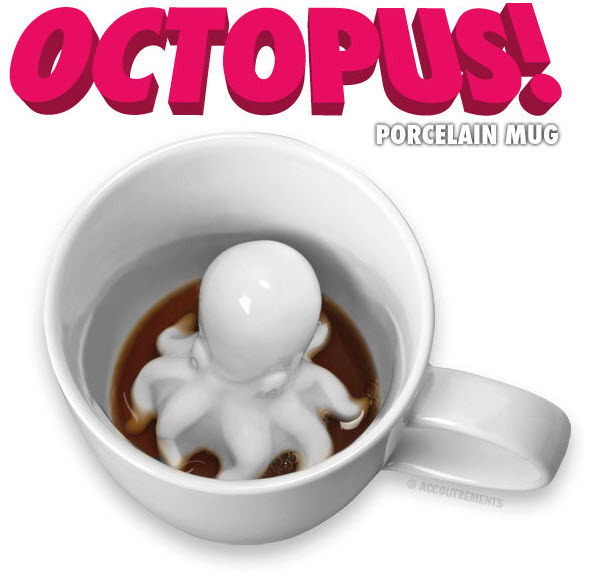 Well, because you have an Octopus Surprise Mug - that's why! Product Specifications Simple looking, white, porcelain mug holds an octopus waiting to surprise unknowing drinkers. Great for scaring friends, and/or coworkers. Dishwasher and microwave safe. Dimensions: 3.25" tall.